Wheel bearings secure the axle shaft in the wheel hub. They take up the radial and axial forces, while allowing the rotation of the axle shaft and the wheel hub. 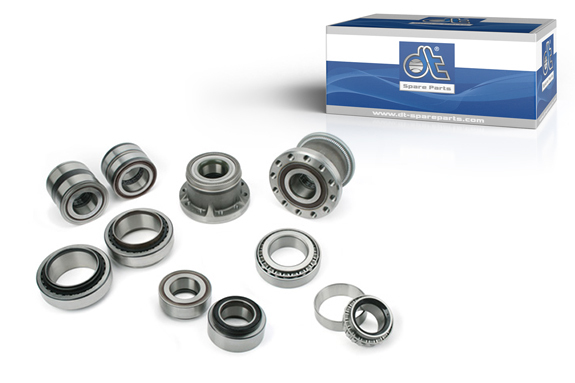 Wheel bearings consist of an inner and an outer ring, as well as the roller elements in between. Basically, a rolling friction occurs between these components, which keeps wear to a minimum. The earlier conventional tapered roller bearings are now replaced by complete roller bearing units. Wheel bearing units have the advantage that they can be more easily installed. DT® wheel bearings are characterised by an optimised inner geometry and an efficient sealing system that protects the bearings from dirt. Freedom from maintenance is achieved by permanent lubrication and the use of durable grease. A reduction in the axle length provides protection against axial movement and incorrect wheel alignment. Special steel is used for the wheel bearing units. This is subjected to special hardening and tempering to ensure a long functionality of the bearings.